The University of Maryland Medical Center confirms that allergic reactions are possible when taking probiotic supplements. Reactions to probiotic-rich foods (like yogurt, kefir, some soy drinks or smoothies, miso, buttermilk, and tempeh) can occur as well. Am I Allergic to Iodine? Symptoms may be mild or quite severe, up to and including anaphylaxis. For a mild allergic reaction, try an antihistamine and call your doctor. A severe reaction may be a medical emergency. See a doctor immediately if you're having difficulty breathing, feel dizzy, or experience tightening of your chest. These symptoms can be severe or life threatening. Chances are if you're experiencing a reaction to probiotics, you're allergic to ingredients in supplements and not the bacteria itself. A 2012 study published in Pediatric Allergy Immunology says many probiotics supplements contain hidden cow's milk or egg proteins (from cross-contamination during processing), which isn't safe for people with allergies to these food items. Other ingredients sometimes hidden in probiotics (and problematic for people with food allergies) include soy, yeast, and lactose. Foods fortified with probiotics (probiotics have been added to these foods to enhance nutrition) may also be contaminated with allergic reaction-causing ingredients during processing. So, read the ingredient list on probiotics carefully to look for items you're allergic to, but keep in mind not all allergic reaction-causing ingredients will be on supplement fact and nutrition labels. This is because of cross contamination, and the fact supplements aren't tightly regulated by the U.S. Food and Drug Administration. Just because you're allergic to one type of probiotics supplement doesn't mean you'll have trouble with all brands. Check ingredients if in your probiotic if you have an allergic reaction and talk to your doctor about finding a brand that has different ingredients. 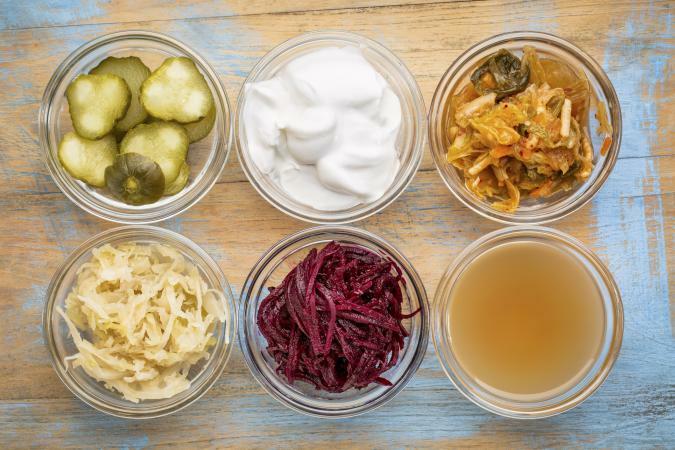 If you experience reactions from supplements or fortified foods, try vegan probiotics or foods naturally rich in probiotics -- like miso, tofu, tempeh, sauerkraut, kimchi, pickled vegetables, and kombucha tea. If you're allergic to milk, egg protein, soy, yeast, or lactose, talk with your doctor before taking probiotics supplements or eating probiotics-fortified foods. The National Center for Complementary and Alternative Health suggests avoiding probiotics supplements (unless your doctor okays it) if you're critically ill, just had surgery, or have a weakened immune systems, as your risk for severe side effects is higher. Probiotics have been studied as a way to help prevent allergies, especially in babies and young children. A 2016 study published in Beneficial Microbes says some studies show benefits from taking probiotics for eczema prevention, and studies examining effects of probiotics on allergic rhinitis and asthma show promising results (but require further research). Authors of the review say the Word Allergy Organization suggests pregnant and nursing women consume probiotics when their babies have high risks for developing allergic diseases. More research is needed to determine long term safety, effectiveness, and appropriate dosages of probiotics. Mayo Clinic suggests it's safe for most healthy people to add probiotics to their diets. If you've had allergic reactions to food before or are allergic to milk, egg protein, soy, yeast, or lactose, talk with your doctor before taking probiotics. Always check the ingredient list on probiotics supplements to be sure you're not allergic to the ingredients, and know that cross contamination can occur.